Will the KonMari Method Help Everyone Declutter? This article is an edit of “My possessions spark joy! Will the KonMari decluttering method work for me?”, originally published by The Conversation. Australia is the sixth-largest contributor of household waste per capita in the world. We spend more than $A10.5 billion annually on goods and services that are never or rarely used. One-quarter of Australians admit to throwing away clothing after just one use, while at the other end of the extreme, 5% of the population save unused items with such tenacity that their homes become dangerously cluttered. This wasteful behavior contributes to costly landfills, environmental degradation, and rising household debt. One in three Australians reports being over-indebted. If unnecessary purchases come at such a profound cost, why do we make them? We acquire some possessions because of their perceived utility. We might purchase a computer to complete work tasks or buy a pressure cooker to make meal preparation easier. But consumer goods often have a psychological value that outweighs their functional value. This psychological value can drive us to acquire and keep things we could do without. Possessions can act as an extension of ourselves. They may remind us of our personal history, our connection to other people, and who we are or who we want to be. Wearing a uniform may convince us that we are a different person. Keeping family photos may remind us that we are loved. A home library may reveal our appreciation for knowledge and enjoyment of reading. Thus, we acquire and hang onto possessions to shape and convey our personal identity. Doing so provides us with comfort and emotional security. Our emotional attachment to possessions can cloud our judgment regarding how useful we think they are to us. We may hang onto items that we have not used in years. We might keep just a few unnecessary items, or we might save an overwhelming amount. Will the KonMari Method help if you’re emotionally attached to your possessions? According to Marie Kondo, “everyone who completes the KonMari Method has successfully kept their house in order”. This bold claim must be evaluated in light of the current science on the psychology of ownership. 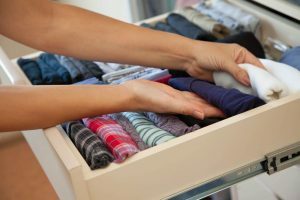 Some aspects of the KonMari Method are consistent with existing evidence. Other aspects may be inadvisable, particularly for those with clinical hoarding problems. Kondo suggests that before starting her process, individuals visualize what they want their home to look like post decluttering. A similar clinical technique is used when treating hoarding disorder. Images of one’s ideal home can act as a powerful amplifier for positive emotions, thereby increasing motivation to discard and organize. Next, the KonMari Method involves organizing by category rather than by location. It requires tidying to be done in a specific order: clothing first, then books, paper, kimono (kitchen, bathroom, garage, and miscellaneous), and sentimental items. By making decisions about sentimental items last, this organization plan bears resemblance to an exposure therapy hierarchy. However, this plan is not very practical as clothing, books, paper, and kimono can have sentimental value. Individuals who experience clinical hoarding symptoms will have many sentimental items scattered amongst non-sentimental items. Accordingly, individuals will need to declutter by area rather than by category. It is important to note that current theoretical models pose that it may be more helpful to progress through an exposure hierarchy in a random order rather than gradually. Thus, it may be useful to learn how to make decisions about challenging sentimental items throughout the decluttering process rather than just at the end of it. Kondo recommends that organizing begins by placing every item within a category on the floor. This suggestion has an evidence base. Our research has shown that people tend to discard more possessions when surrounded by clutter as opposed to being in a tidy environment. However, organizing and categorizing possessions in any context is often challenging for individuals with hoarding disorder. Marie Kondo gives sage advice regarding whether to keep possessions that we think we may use in the future. A focus on future utility is a common thinking trap, as many saved items are never used. She encourages us to think about the true purpose of possessions: wearing the shirt or reading the book. If we aren’t doing those things, we should give the item to someone who will. Another Kondo suggestion is to thank our possessions before we discard them. The purpose of this practice is to recognize that an item has served its purpose. She believes this process will facilitate letting go. However, by thanking our items we might inadvertently increase their perceived humanness. Our research funded by the IOCDF shows that anthropomorphizing inanimate objects increases the sentimental value and perceived utility items, which increases object attachment. People who are dissatisfied with their interpersonal relationships are more prone to anthropomorphism and have greater difficulties making decisions. Thus, this strategy may be particularly unhelpful for them. One of the key messages from Marie Kondo is to discard any item that does not “spark joy”. For someone with excessive emotional attachment to objects, focusing on one’s emotional reaction may not be helpful. People who hoard experience intense positive emotions in response to many of their possessions. Considering whether items are associated with positive emotions may encourage them to keep too many items. For others, it may fuel consumerism, in which they buy items to feel joy, discard them when they no longer bring joy, and then buy new items for the purpose of feeling joy again. Once a person has decided which items they are keeping, Kondo recommends that each item is stored in a designated place in your home. The place should not be on top of another possession. She further recommends a specific folding technique so that clothes can always be seen. The idea that our possessions should always be seen is a nice one. Disorganized possessions can lead us to buy extra because we can’t find something. However, focusing on a specific folding practice stays away from the initial message that we should make do with less. It may also fuel perfectionistic beliefs among persons with obsessive-compulsive symptoms. Thus, we recommend not getting caught up in the folding frenzy, but instead, focus on having fewer items in your home. Finally, we should consider how we get rid of our stuff. With the rise of fast-fashion, for example, many may throw out clothing very easily, with the expectation that it can be quickly and easily replaced. Sustainability Victoria recently issued an urgent advisory to Netflix-inspired de-clutterers to reduce, reuse, and recycle rather than just tossing into landfill. Dumping everything into the op-shop or local charity bin is also problematic. Aussie charities are paying $13 million a year to send unusable donations to landfill. Following the KonMari method is not going to solve the problem of overflowing landfills. Ultimately, we need to make more thoughtful decisions about both acquiring and discarding possessions. Thus, we encourage people not to lose sight of the bigger problem: overconsumption. We need to buy less, buy used, and pass our possessions onto someone else when we have stopped using them for their functional utility. If you want help for hoarding disorder, please seek out a specialist who has been trained in cognitive-behavioural therapy for hoarding disorder. I thought this was a timely article, since Marie Kondo has been such a hit internationally. I personally enjoyed her Netflix series which includes people with mild hoarding. I think her ideas include living more simply, and she is from Japan where she says a family often lives in a very small space with not many possessions. I think many hoarders anthropomorphize more than others, and Kondo’s technique of “thanking” the item for its service can be freeing. I did use some of her techniques and ideas, including her folding so that things are visible, with a client with significant clutter. This client also has OCD which interferes with decision-making, and so this method was not so helpful. However, I do think the visibility of clothing by her method makes the method useful for people with ADHD. Why Attend the 7th Annual Hoarding Meeting?